All alphabet books help children learn about letters. Amazing British Columbia does much, much more. Librarians and educators recognize the potential for this alphabet book to teach even adult learners. 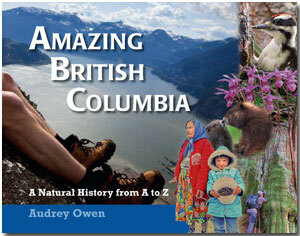 "BC comes alive complete with a wealth of fascinating information and stunning photographs. You won't want to miss this book for your school library." "Amazing British Columbia is not your typical ABC book. Rich with details about our amazing province, it makes for an absorbing read that young and old will enjoy. Whatever your background, you are bound to discover something new about our province." "This book is a fabulous addition to the alphabet book market. Moving beyond the introduction of the letters themselves, this book educates at a deeper level and invites the reader to learn more about the stunning province of British Columbia. While it would be welcome in any elementary school or home where children reside, I think it will also be a great reference for adult learners and those new to the English language." "It's the sort of book that respects the intelligence of kids. It takes into account their knowledge of and exposure to natural history." I learned something on every single page!" [This] is a beautiful book! So well done, and yes, I did learn things! I can't wait for my grandchildren to see it. It will be terrific, especially for the ones in Indonesia.